Despite another beauty from the Sam Rent’s collection, it wasn’t enough for the hosts to avoid back-to-back defeats for the first time this season. Despite rumours of BUPA looking to sponsor the club, along with an application going in to the Council this week for planning permission to extend the Physio Room, it was still a strong line-up that took to the pitch for this eagerly awaited top-of-the-table clash. Alex Parsons and Captain, Darren Budd both returned from suspension in place of the now suspended, Joel Colbran and, the injured Danny Barker. 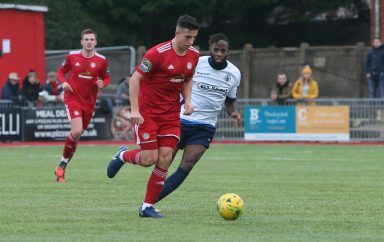 Reece Myles-Meekums marked the start of his second month on loan from Bromley by coming in for the crocked David Ajiboye, while Jasper Pattenden was preferred to Tyrese Mthunzi on the bench. In parts, the first half matched the weather; dull and uninspiring, as both teams struggled to get going in the damp and dreary conditions. Ryan Charles had the first go at breaking the monotony, forcing Perntreou into tipping his low, fizzing shot from outside the area, round the post. It then fell to Luke Callander to try his luck but he couldn’t keep his shot down, before the Premier Divisions’ top scorer and Stortford Player-Joint-Caretaker-Manager, Jamie Cureton, curled an effort narrowly wide of the opposite top corner, from the left-hand side of the penalty area. Following his penalty-saving heroics in the last home game, Kleton pulled off another top-draw stop to deny Alfie Mason from point-blank range, while the resulting flag-kick produced another nearly-but-not-quite moment from the evergreen Cureton, whose overhead kick, went over. Will Miles got Callum Kitscha off his chaise lounge, when he headed the hosts opening gambit over, after Sam Rents had picked him out at the back stick with his set-piece delivery. Cureton and Kleton were at it again, as this time, the latter kept out the former, until Jesse Starkey found Reece Myles-Meekums at the near post, where his neat flick had Kitscha concerned but alert enough to prevent the visitors going behind. Mercifully, for most, the referee only added the customary minute to the preceding forty-five and, the brave eight hundred and forty-six in attendance were able to drift inside, out of the wind and rain. Even the cameraman gave up and filmed the second period from the main stand. Alex Parsons must have had his weetabix at the break, as he tested Kitscha a matter of seconds after the restart, with Ricky Aguiar’s follow-up being blocked behind. Kleton appeared to have been on something stronger during the interval, as he spilled a low, ambitious effort from Charles but, gathered safely at the second attempt. Several minutes elapsed before Budd made space for a shot, by shifting the ball onto his right foot, just outside the box and saw it sail over the top of the target. Shortly after we’d, remarkably, reached the hour mark, Stortford stunned the home crowd by taking the lead. 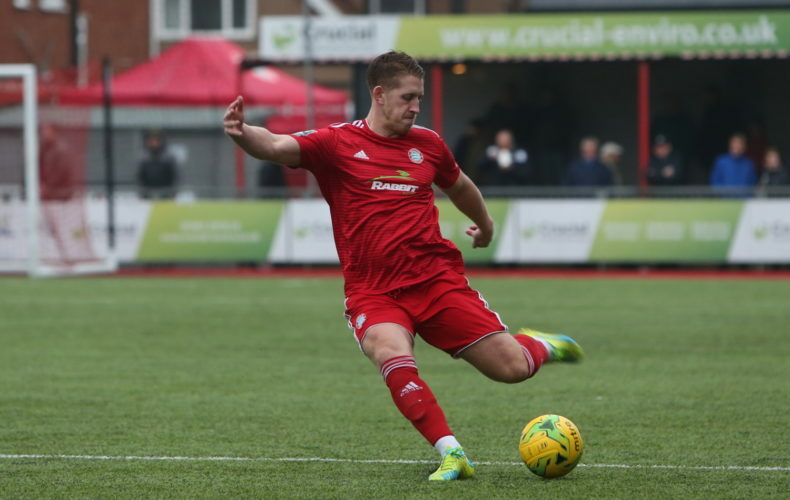 Captain, Sam Robbins rose highest at Mason’s right wing corner, to guide his header over a crowded six yard box and into the far side of the net. Reds responded through Starkey, who whipped in a beauty from the inside right channel but, agonisingly, no teammate was able to get on the end of it. With three quarters of the game gone, Callum Kealy’s powerfully-struck pearler hit the inside of the post and rebounded out to Parsons, who looked certain to score, only to be denied an equaliser by the last-ditch challenge of Mason. Then, drop me out ! Bishop’s made their match-winning move; as Charles seized on a misplaced, midfield pass by Ricky Aguiar and released substitute, Nick Brown down the middle. He raced away and slotted through the legs of a horribly exposed Perntreou, to double the deficit. 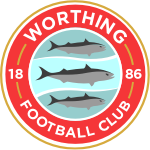 In typical, never-say-die fashion however, Worthing hit back, as Jack Thomas threw himself in the way of a Ricky rompertomper and the ball struck his hand. Queue, Sam Rents, who stepped up to send an absolute howitzer over the wall and into the opposite top corner, via the underside of the crossbar, to give the hosts hope. 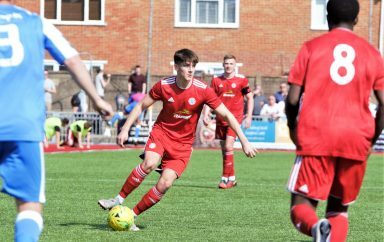 Sadly though, despite their best efforts, the men in red only had one real last chance, from the right boot of Will Miles, on the left-hand side of the area, that flashed just past the same top corner, four minutes into stoppage time.